Exhaustive studies by The National Waterways Foundation (NWF), a center for research and learning where industry leaders address public policy issues related to America’s inland waterways system, conclude that inland waterways transport generates fewer emissions of particulate matter, hydrocarbons, carbon monoxide and nitrous oxide than rail or truck on a per ton mile moved basis. But, it’s one thing to claim that metric, and another altogether to prove it to shippers and other freight stakeholders. The time to do that, says the U.S. Environmental Protection Agency (EPA), is now. Since 2011, the EPA has fostered an initiative to protect public health and the environment and promote sustainable economic growth by reducing pollution from thousands of short-haul trucks that service the nation’s ports. Under the SmartWay dray truck initiative, carriers signed an agreement with EPA to track and reduce PM 2.5 emissions by 50 percent and nitrogen oxides (NOx) emissions by 25 percent below the industry average over a three year period. Initial SmartWay partners included some of the nation’s biggest retailers. Since that time, retailers, trucking and rail companies and manufacturers have reduced fuel use, cut foreign oil imports by 50 million barrels and saved an estimated $6.1 billion in fuel costs. Encouraged by its success on land, the EPA has since begun a new Barge Freight component of the program, with Ingram Barge Company announcing its participation in 2014. Ingram has been involved with the EPA in helping to develop, test and pilot the tool since 2010 and Ingram hopes that others will follow its lead in committing to improve efficiency and reduce pollution. SmartWay, currently composed of more than 3,000 truck, rail carriers and shippers that hire them, helps reduce emissions in order to help companies use less fuel, leading to cost and environmental savings. The new Barge Freight component of SmartWay will help shippers to more completely determine the carbon produced by their freight supply chains, and to see the clear environmental benefits of moving freight via barge transport. That’s because the EPA recognizes that inland marine freight movement accounts for more than 600 million tons of cargo, with an annual value in excess of $70 billion dollars, and is an exceedingly efficient means of freight transportation. According to the EPA, shippers seeking the most environmentally friendly mode of bulk freight transportation will discover Ingram Barge Company as such a leader. SmartWay partners have saved over 121 million barrels of oil, which is equivalent to taking more than 10 million cars off the road, and has saved U.S. industry $16.8 billion in fuel costs since its inception in 2004. As for Ingram, the firm also received in 2011 the Southeast Diesel Collaborative “Leadership Award” for its environmental sustainability efforts utilizing advanced clean diesel technology on towboats operating on the inland river system. Today, Ingram is one of the largest inland marine transportation companies in the U.S. moving nearly 100 million tons of cargo annually on the nation’s rivers. Ingram’s David Sehrt, Senior Vice President and Chief Operations Officer, explains, “Our long-term commitment to air emissions reduction spans 15 years through a diesel engine upgrade and replacement program within our fleet of 130 towboats.” Ingram was named as one of the first marine transportation companies to be accepted as a partner in the U.S. Environmental Protection Agency’s SmartWay Program. Not to be outdone, the American Waterways Operators, a 350-member trade association representing the U.S. tugboat, towboat and barge industry, announced in July of 2014 that it joined the SmartWay Transport Partnership. According to AWO, the move is a commitment to educate its members about the program’s benefits and encouraging their participation as SmartWay Partners. A senior EPA official told MarineNews in February, “The EPA provides assessment and tracking tools for carriers to measure their environmental performance and reviews data before it is used. Currently the program offers tools for the trucking, rail, multimodal and logistics sectors. Barge is the newest addition to the SmartWay portfolio. Shippers using the SmartWay shipper tool can use this information to calculate their carbon footprint from their transportation operations.” Beyond this, the information also helps companies better understand how selecting different modes and carriers to fit each shipping need could help them to reduce energy use across their transportation supply chain, which cuts costs and reduces emissions. At the same time, EPA respects and protects those participants’ proprietary data. 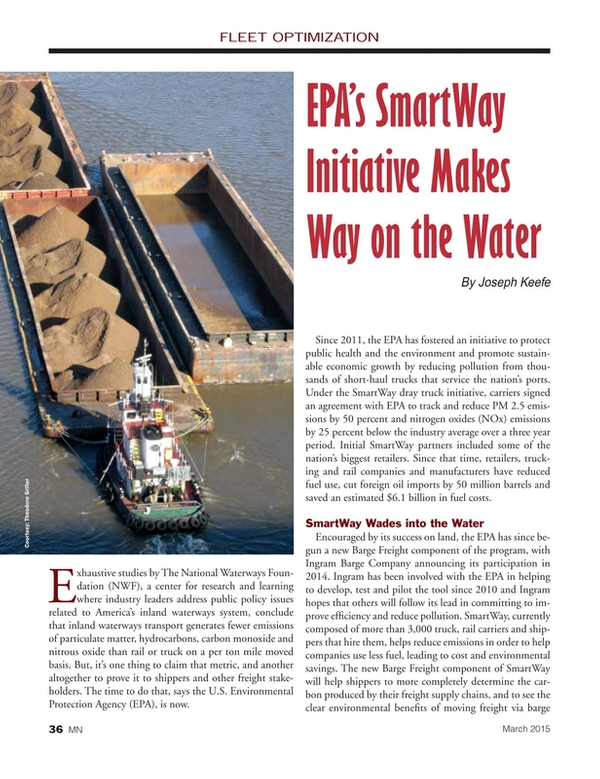 Each of EPA’s SmartWay assessment tools help SmartWay partners – including barge companies – to look at their business operations from an environmental perspective. They can benchmark current energy consumption and emissions and quantify the benefits of changes in operational efficiency over time. Because SmartWay offers a uniform and integrated platform for sharing quality-checked data among carriers and their customers, participation in SmartWay offers carrier companies like barge firms a transparent and credible way to demonstrate how they are improving over time. Carriers like barge companies that cut emissions by saving fuel also see cost savings. That’s a huge benefit. SmartWay aims to facilitate more transparent and consistent information exchanges among the many participants in goods movement to support more informed business decisions; by serving as a ‘clearinghouse’ for best practices and information-sharing and, eventually, and by offering recognition and incentives for top performers. Companies submit data annually. SmartWay reviews each data submission, then reports out the carbon dioxide, particulate matter (PM), and oxides of nitrogen (NOx)emissions, also annually. These are reported in both grams per mile and grams per ton-mile metrics. Currently, over 3,000 companies are registered with SmartWay, most in other modes, but clearly, EPA hopes that the Barge component will be as successful as its land based predecessor. EPA in turn provides information to SmartWay participants about their carbon emissions from transportation operations. Since transportation is part of a company’s overall carbon footprint, a company could chose to use this information in many ways, including for voluntary carbon reporting and disclosure. The information they get from SmartWay can also be readily integrated into a company’s corporate ‘green’ efforts and used to benchmark and track environmental progress. The principal data variables that influence the published emission factors are tons payload, miles operation, number and type of vehicles in a given fleet, age of the engines, and how much and what type of fuel is burned. Depending upon partner type, data from other EPA models may be used for some calculations. For example, EPA MOVES emissions factors are used in the truck tools to help calculate NOx and PM. Other pieces of data not directly used for the calculation are used to accurately identify and categorize partners, ensure data quality and guide partners in using the tool. Before EPA developed the barge tool, it reached out to the barge community – companies and associations representing barge operators – to gauge their interest in EPA including barge transport in SmartWay. These stakeholders not only encouraged EPA to offer a barge tool for SmartWay, they shared valuable expertise and information with EPA to help develop the tool. In fact, two barge companies actually helped EPA to beta test the tool. Shipper companies have also been asking EPA to include barge in SmartWay, since most shippers want to see a more complete picture of their transportation supply chains. In February, EPA held a webinar to describe the SmartWay program, demonstrate the barge tool, and answer questions about how join SmartWay. The webinar, led by Matthew Payne, EPA Team Leader at SmartWay Transport Partnership, was well attended and received by industry, demonstrated that already, there is broad and growing support or “buy in” within the barge community and within the customer base it serves. And, companies can join now. The barge tool is available on the SmartWay web site and the EPA is encouraging all barge operators to take a look and consider joining. Any firm wanting to become SmartWay-registered this year would need to do so and submit data by May 6.